Wondering what to do with all the apples you’ve just gathered at Linvilla? Visit FoodInJars blogger Marisa McClellan’s cooking demonstration at 4 p.m. She will be sure you leave with a few fun and yummy ideas! Build some delicious family memories as you pick-your-own apples at Linvilla Orchards during the Apple Festival on September 24 and 25, beginning at 8 a.m. The weekend includes tons of fun for the young—and the young at heart—including: hayrides, pony rides, face painting, children’s entertainment, costumed characters, games & contests, music, apple treats and recipes, candy apples, Pumpkinland and lunch at the Linvilla Grill. With 25 apple varieties to pick from—including Pink Lady, Mutsu and Jonagold—you’ll find your perfect apple for baking, applesauce, snacking and more. 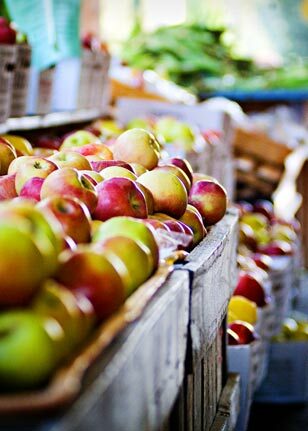 The Farm Market will be carrying their famous apple pie, fresh apple cider and delicious apple butter. If you’re a hard-core apple lover, chow down at the Apple Pie Eating Contest to win the champion title and a prize. There will be three age brackets: 6-10, 11-16 and 17 and older. Bring your camera to capture the bushels of fun! Looking for entertainment for the kids? The event will be hosted by Officer Offbeat, the Juggling Jester of Justice, with music, games and prizes beginning at 11 a.m. Make sure the kids find the costumed characters at various times throughout the day! Handyman Rob will be making his appearance at 11:30 a.m., the Traveling Train at 1 p.m., and the Absorbent Sea Creature at 2:15 p.m. Ultimate kid entertainer, Bill Kerwood will be giving a performance beginning at 3 p.m. Wondering what to do with all the apples you’ve just gathered? Visit FoodInJars blogger Marisa McClellan’s cooking demonstration at 4 p.m. She will be sure you leave with a few ideas. While you’re visiting Pumpkinland, get lost in a straw bale or cornfield maze, have your face painted, check out the Jack-O-Lantern exhibit, cruise the rails on a fall train ride, tap your foot to the live music and enjoy the fields ripe for harvest on an autumn hayride. Linvilla Orchards is a 300-acre family farm dedicated to agriculture, education and entertainment. To learn more, visit www.linvilla.com or call 610-876-7116. Linvilla Orchards Entertainment Garden is located at 137 West Knowlton Road, Media, PA.